A suburban train at a railway station. ‘Electrichka’ travel is a great way to see more of Russia and its people. There’s a joke in Moscow that expats earn the right to be called locals if they start regularly commuting on suburban trains or ‘electrichkas.’ The city’s metro is very easy to navigate and there are maps everywhere, even if English is only slowly catching on. But an electrichka on the other hand, while clean, comfortable and safe, is seen as an adventure and is one of the first modes of transport that give people a look into the vastness of Russia. 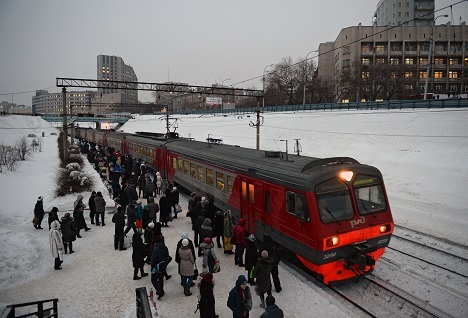 The suburban trains connect Moscow with many small towns in the outskirts of the capital, and are also popular in the summer with Muscovites who head off to their dachas. Even in the newer trains that run from Moscow, there are hardly any audible public announcements about the next stop, so unless a person is familiar with the route, it’s easy to miss a stop or two. In September, I made it a point to get my local badge by visiting friends in Moscow’s suburbs by regularly taking the electrichkas, during non rush hours. This actually turned out to be a great way to interact with people I would have never met otherwise. On a ride to the historical town of Mozhaysk (famous for the Battle of Borodino), I met a veteran of the Afghan War, who described his time in the war-torn country in the 1980s. Another time, when I picked up a random conversation with a person on a longer ride, more people started joining the discussions that ranged from geopolitics to the mysteries of the universe! There is no chance in hell that this would have happened in busy Moscow. But Muscovites leave their “always in a hurry” attitude in the metro, and seem to be more at ease when traveling in an electrichka. The trains also have an interesting mix of talented performers and musicians who come on board to showcase their talents for some spare change. The electrichkas are one of the best legacies of the Soviet Union, which made sure that many small villages were connected to towns and cities by these trains. I’ve been fortunate enough to travel in these trains in many smaller and distant parts of the country. In Moscow, the tickets now have to be bought from electronic machines and have a bar code that is scanned. This technology hadn’t reached smaller towns when I travelled with my friends in Siberia and the Russian Far East during the last decade. On my numerous trips to the city of Vladivostok, my then-university going friends insisted that we travel ticketless. It really looked at that time like no one ever did buy tickets on the trains that connected the city with some famous and beautiful sites like the sanatorium and the Shamora Bay. Being a “good boy” from Bombay, I was uncomfortable with the idea of traveling ticketless and was sure that we’d get caught at least once. My friends laughed and said the Russian Railways would finally make some money if they caught and fined every single person on the train. One day when the same joke was being cracked, we saw a man in uniform walk into our wagon. So here we were, finally getting caught for travelling ticketless on a train, or so we thought. The man ignored all the other passengers and came straight to me. Ready to pay a fine for my crime, I was about to reach into my pocket, when he asked me in decent English if I had a cigarette! We all burst into laughter. That particular day, I insisted that we buy tickets for the train back to Vladivostok but much to our surprise, the ticket counter was unmanned at the station. From nervous illegal Chinese immigrants evading the police to musicians heading for a rave concert, I have always seen “interesting” people on my Vladivostok electrichka rides, but one incident stands out. As our train was heading out of the city, we heard a little boy singing in our wagon. He had a good voice but was singing in a language that none of us understood. He happened to be a gypsy! I knew Russia had its share of gypsies but didn’t realize they travelled all the way the country’s Pacific coast. The boy may have been 7 or 8 years old. As he went to collect money from the passengers, he saw me. We seemed equally surprised to see each other. This child had very strong Indian features and was the first Indian-looking person I had seen for months. He must have wondered where I was from and kept staring at me. We gave him a fruit and a chocolate bar (he earned it with his singing) and then tried to ask him something in Russian, as we were extremely curious. He didn’t understand us. I had read somewhere that some of the gypsy tribes spoke a language that was similar to Hindi, but this boy didn’t understand anything I said. I still wonder about that child’s story. He must be a young adult now! I would recommend an electrichka ride for any traveler who visits Russia. Rarely have I met someone who did not have one interesting story or another from a ride on a Russian suburban train.